When the Co-operative Society Funeralcare decided that their existing premises had become too cramped and outdated, they identified an existing building in the centre of Nuneaton that could possibly be converted to provide their central hub for all the satellite premises they had within the Warwickshire area. Working closely with Alan C Riley Associates it was decided to retain the heritage of the building and demolish an existing 1960’s flat roof extension to the side. Two new extensions for a new entrance and for the parking of vehicles were proposed, albeit using a sympathetic aesthetic that would mirror the original building’s design. Originally built as a school in the early 1900’s the building had had a number of uses, the most recent being a youth centre. During this time a side extension had been built in the international style of the 1960’s and it had partially hidden the former main entrance to the school. Some stonework was visible above the flat roof and a carved stone crest was partially evident but until the extension was demolished it was difficult to assess what work would be required. Internally the building was to be radically reorganised to provide a new reception, arranging rooms, chapels of rest, a mortuary and other ancillary accommodation. 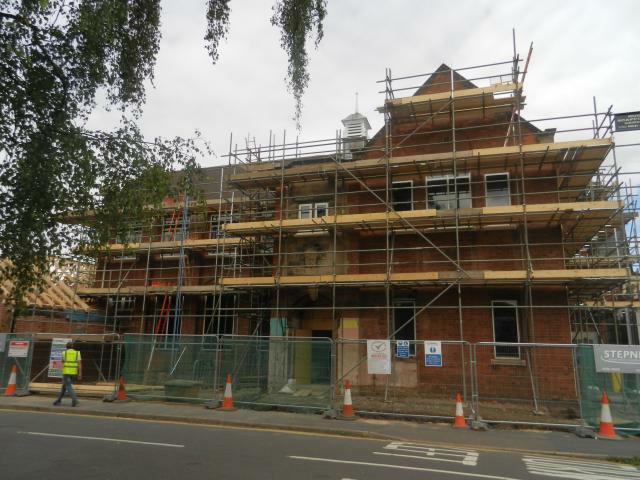 Due to the building occupying most of the site is was determined that a large new lift would be installed to the rear that would provide access to the upper floors and the mortuary. The completed construction project costs were approximately £600,000, excluding furniture and fittings which were supplied by the client. The final sum included for additional works to the existing walls where the 1960’s extension had been taken down. When the walls were stripped it was found that the walls had been severely damaged and beyond repair. The stone crest above the doorway was however saved, cleaned and repaired as far as possible, along with the surrounding stonework. To hide the damaged brickwork at ground floor level, Alan Riley designed a new stone façade and archway to the face of the wall which can be seen on the finished building, which adds to the pleasing overall aesthetic.